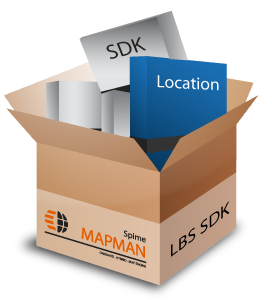 Spime’s comprehensive MapMan LBS SDK includes over 80 APIs, reference applications and code, support for 19 languages and complete documentation. Powerful APIs allow developers with no location expertise to quickly and easily access complete Social Location functionality including pre-integrated content, voice guided turn by turn navigation functionality, Spime Cloud Based Services and more. Developers can build differentiated applications, content and services without the up-front investment to integrate complex content and software (For example 3D functionality). And, tightly coupled Spime Cloud Based Services provides the mechanism for monetization and funds settlement. MapMan LBS SDK enables the creation and monetization of vibrant 3rd party ecosystems.